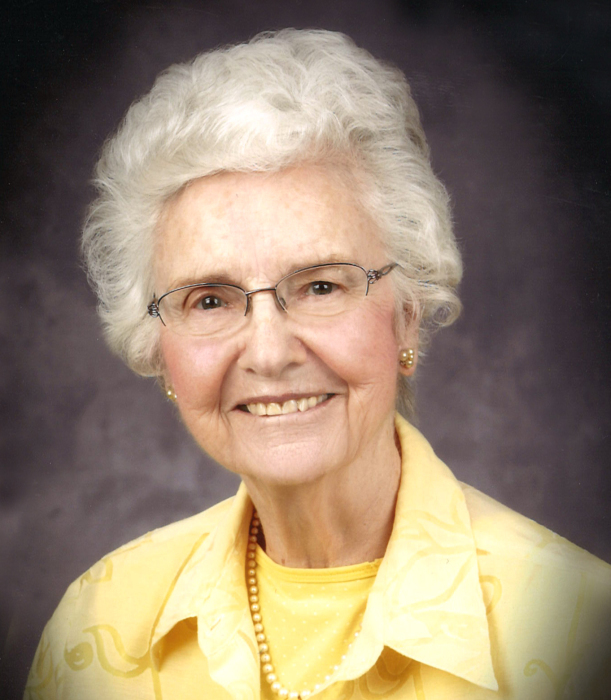 Maxine passed away peacefully at Cedars Villa Extendicare on Sunday, April 14, 2019. She was born on August 13, 1927 in Hollywood, California to Thelma and Joseph Callaghan. In November of 1951 she married Leo, who preceded her in death in 2011. Maxine, the oldest of two children, came with her parents to the Buffalo, Alberta area in 1928 where the family homesteaded during the great depression. She completed Edmonton Normal School and taught on the prairies until she married Leo. Maxine was always an active member of the Catholic Church including CYO, Family Life Ministry, Cursillos, and the CWL for many years. Maxine was also a great homemaker, known for her amazing and frugal skill to sew or repair just about any piece of clothing. She will be fondly remembered for her dedication to her family. Maxine will be deeply missed by her seven children, Dennis (Brenda), Kathleen (Patric Letourneau), Sharon, Patricia, Nora (Peter O’Shaughnessy), Kevin (Iris), and Tim (Shelley); as well as her twenty four grandchildren, and twenty five great grandchildren. There's still time to send flowers to the Funeral Mass at the St. Pius X Catholic Church at 11:00 AM on April 25, 2019.